Last Saturday evening, French choreographer Hervé Koubi and 12 Algerian and Burkina Faso performers presented “What the Day Owes the Night” at the Irvine Barclay Theater in a fascinating act that assimilated both urban and contemporary dance styles to a fusion of music, ranging from opera to indigenous-based melodies. Hervé is a very french name, Koubi said himself. His surname, however? Not so much. Koubi’s performance attempted to examine his cultural history on his father’s side. His story involves his efforts to reconnect with his Algerian heritage, and his choreography reflects the entanglements of the culture and ancestry that he identifies with. Koubi had always considered himself French, since he grew up in the south of France. It wasn’t until he was 25 and his father was on his deathbed that Koubi discovered his great grandfather was Algerian. After finishing his formal education at the Rosella Hightower School of Dance in Cannes and Opéra de Marseille in 2009, he chose 12 male, Algerian and Burkina Faso dancers through an audition, and began to realize that his long-term project would be to explore the complexities of his heritage. 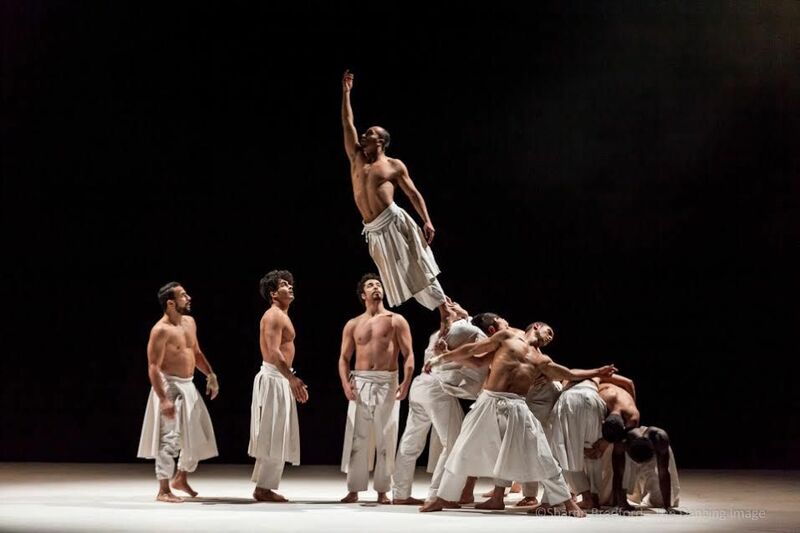 Powerfully athletic, Compagnie Hervé Koubi performed a vigorous choreography, involving dance and martial art combinations, including breakdance moves, head spins and breathtaking trust-falls. Members of the audience audibly gasped throughout the act, taken away by the agility of the dancers. Swiftly flipping in the air, the performers managed to land softly on their feet unharmed. “It is as if an Orientalist from the 19th-century came to Algeria to give life to his dreams of the Orient; I would like to give life to my dreams; a child born in France who discovered, belatedly, his true origins and those of his parents, Algerians from birth,” Koubi told the audience. Amid a simple set with no props and dim lighting, the choreography begins calmly, the pace of the dance steadily quickens as the performers spin across the stage through the air and along the floor. The dancers each move to the music each in their own performances, facing different directions on stage. Despite each performer’s unique moves, there is a cohesiveness to the performance that comes together, forming a singular act. Throughout the choreography, the dancers take the audience through the paths Koubi himself travelled to explore his own heritage. There are brusque changes to the music and choreography as it halts, then continues, then halts again, keeping the audience on their toes. In the final act of the night, Koubi concluded the performance with a poem, written by him and spoken by one of the dancers in Arabic. His intentions in this seem to bring closure to his exploration, defining a point in which he has finally reached “there” (presumably Algeria) or a deeper understanding of the Algerian culture he seeks to reconnect with.